A1. All job seeker functions are free to use. There are fees employers may have to pay for their job listings. Q2. Is an approved profile and resume all I need for employers to find me? A2. No. If you want employers to notice you, apply! Most employers won’t seek you out – they get plenty of applicants seeking them out. Q3. Do all profiles and resumes get approved? A3. No. I don’t hit approve on profiles that don’t include a resume because there’s nothing there for an employer to see. I also delete profiles that are clearly only backlink spam, not resumes. Q4. Do I have to post a resume? A4. No. You can still do most things on the website without a posted resume, including apply for jobs. Most will have you apply on their website, not here. You should be customizing your resume for each job you apply to – don’t just send a generic resume to all jobs regardless of what it is. Q5. Can I save searches? A5. You can subscribe to searches by email or RSS feed. Q6. Do applications go through the job board or the employer’s website? A6. That’s up to the employer. Some will have you fill out an application here, while others will have you follow a link to their website. Q7. How do I know if a job is a scam? A7. I try to keep scams off this website, but there are no guarantees. For starters, if the pay is too high for the work being done, if you have to pay to apply, or the listing is really vague, be concerned about a scam. 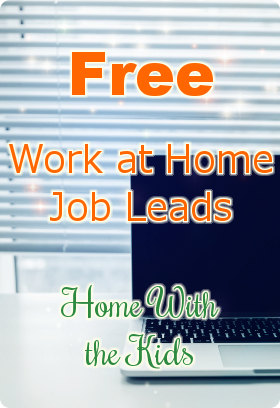 I have a lot more information about work at home scams posted elsewhere on this site. Q8. What is a featured listing? A8. A featured listing is listed at the top of the category listings. Q9. Can a job be listed in more than one category? Q10. Are all the jobs based from home? A10. Pretty much. I will also approve jobs that are only partially done from home or that are extremely flexible; they don’t have to be done entirely at home. Merchandiser and mystery shopping jobs, for example, will be considered. Q11. Will all jobs submitted be approved? A11. Of course not! Jobs that are done primarily at the office, home business opportunities, jobs that I’m not certain are legitimate and obvious scams will not be approved. If you disagree with a rejection, contact me and say why. You might change my mind. A12. If they’ve listed a job here recently, it’s possible, although listings may last longer than job openings. If they haven’t listed a job here recently, it’s still possible, but I don’t know. I don’t work for them and I can’t keep track of who all is hiring at a particular time. Check with them. It can’t hurt to look at the job listings on their website. Q13. Why is (company) not listed on the Employers List page? A13. The Employers List only shows employers who have created an account for themselves on the Home With the Kids Job Board. If I added their jobs myself, they are not included there. Q14. What if I have more questions?